The 2014 Chevrolet Express Van is the do-it-all work truck that is as tough as it is versatile. The 2014 chevrolet express 3500 passenger electric vehicle qualifies for a federal tax credit of up to $7,500, effectively reducing the net base price. If you need to move a lot of people, a lot of cargo or some combination of the two, the 2014 Chevrolet Express Van has the right stuff to get the job done. While newer vans like the Nissan NV and the forthcoming Ford Transit offer more vertical interior space, they don’t have the hauling power of the Express Van’s Duramax diesel, or the option of all-wheel drive. When outfitted to haul people, the Express Van exceeds the passenger count of even the largest SUV, with seating for up to 15 people. If you plan to haul cargo, a massive 285-cubic-foot cargo bay awaits. The Express Van can also be outfitted as a rolling workshop with shelving, storage bins and a choice of door options for easier access. If you’re looking for a time-tested van that can handle almost any task in any weather, the 2014 Chevy Express Van is for you. Its traditional van profile makes it easier to park in smaller garages, and unlike its competitors, the Express offers a choice of gasoline-, natural gas- and diesel-powered engines. If you need the ability to stand up inside your van, the Express Van’s low roof probably won’t be as comfortable as a Nissan NV or Mercedes-Benz Sprinter van. If you don’t need to move massive amounts of cargo, a smaller, more maneuverable option might be the Ford Transit Connect. The 2014 Chevy Express Van cargo van can now be equipped with 5-passenger seating featuring a bulkhead partition between the 2nd-row seat and the cargo area. Side curtain airbags protect rear-seat passengers while extended-wheelbase models include rear air conditioning. Passenger vans add power windows and locks as standard equipment. The 2014 Chevy Express Van’s standard V6 engine might deliver the best fuel economy option, but with only 195 horsepower, we don’t think it’s really the best choice for moving a loaded van, at least not efficiently. A better choice is the available 5.3-liter V8. With 310 horsepower and 334 lb-ft of torque, this engine has the muscle to move a loaded Express Van with confidence. Of course, our personal choice would be the mighty 6.6-liter Duramax diesel that pumps out 260 horsepower and whopping 525 lb-ft of torque. If you’re not comfortable with a diesel engine, there is also a 6.0-liter V8 that can run on either gasoline or compressed natural gas (CNG). On the 3500 model with the Duramax engine, Gross Vehicle Weight Rating (GVWR) is 9,600 pounds with a 10,000-pound tow rating. In the past, buyers could choose between hauling cargo or passengers, but not both. The new, 5-passenger cargo van option allows plenty of room for people and cargo and even offers side curtain airbag protection for all occupants. With a trailer tow rating up to 10,000 pounds, a choice of half, three-quarter ton or 1-ton chassis, a range of engine and fuel choices, and even available AWD, the 2014 Express Van from Chevrolet is the most flexible full-size van on the market. 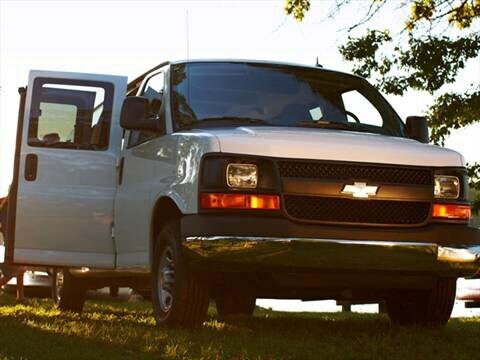 In its purest form, the Chevy Express Van for 2014 is a 2-person rig with a massive metal cave residing behind the very supportive high-back front bucket seats. An empty canvas, the Express Van’s cargo bay can be configured by any aftermarket customizer, or by taking advantage of Chevy’s many option packages that include flip-up access panels that allow easy access from outside the van to the rack-mounted tools inside. At the opposite end of the spectrum is the Express Passenger Van that allows for such luxuries as power windows, additional seating, carpet, navigation, rear air conditioning and Bluetooth. Let’s face it, when the ultimate interior configuration of a vehicle is basically a giant elongated cube, there’s not a whole lot of leeway for shaping the exterior. Still, Chevy has modernized its big van with rounded corners, high-mounted taillights and stylish truck-like wheels. The 2014 Chevy Express Van’s grille may be its most ornate feature, resembling the trademark look that adorns Chevy’s big pickup trucks. Door options include sliding or split swing-out side doors, and split rear doors with or without windows. Handy exterior accessories include a roof-mounted ladder rack, roof-rack cross-rail system, and mud flaps. Listed among the Chevrolet Express Cargo Van’s standard features are a V6 engine, vinyl flooring and upholstery, air conditioning, a step-up rear bumper and manually operated exterior mirrors. Frills are not part of the deal, though the Passenger Van does jazz things up some, with a V8 engine, power windows and door locks, carpeting and cloth seats. All 2014 Chevy Express models are equipped with stability control, 4-wheel anti-lock disc brakes and dual front airbags. Passenger vans features side-curtain airbags covering the first three rows. Creature comforts are not what you’d call plentiful on the 2013 Chevy Express Van cargo van, so shoppers will need to look to the options list if they want power windows and door locks or, if they’re really feeling crazy, a radio. There are also choices of engines, light-duty (Express 1500) or heavy-duty (Express 2500 and 3500) models, body lengths and various packages. Some of the more noteworthy options include navigation, a rearview camera, rear park assist, Bluetooth connectivity and the most recent version of OnStar. If fuel economy is a primary concern, a 2014 Chevrolet Express 1500 Cargo Van equipped with the base 4.3-liter V6 is a buyer’s best choice. That 6-cylinder is expected to average 20 mpg on the highway, but with 195 horsepower, it’s not exactly a powerhouse. Though less efficient, the Express Van’s four available V8s promise to get most any job done with up to 324 horsepower and 525 lb-ft of torque. There is also a CNG (compressed natural gas) conversion for the 6.0-liter gasoline engine that includes hardened valve seats and a special 3-tank fuel-tank configuration. The 3500 vans can be equipped with stump-pulling power of the 6.6-liter Duramax diesel. Chevrolet has set the Manufacturer’s Suggested Retail Price (MSRP) for the 2014 Express Van at just under $28,000 for the base model and over $50,000 for a fully loaded version. Prices are always changing, so before agreeing to a deal, make sure to check the KBB Fair Purchase Price to determine what buyers in your area are actually paying. Over time, the 2014 Chevrolet Express Van is expected to hold its value better than its major competitor, the Ford E-Series van, but faces a still unknown challenge from the Nissan NV and upcoming 2015 Ford Transit.